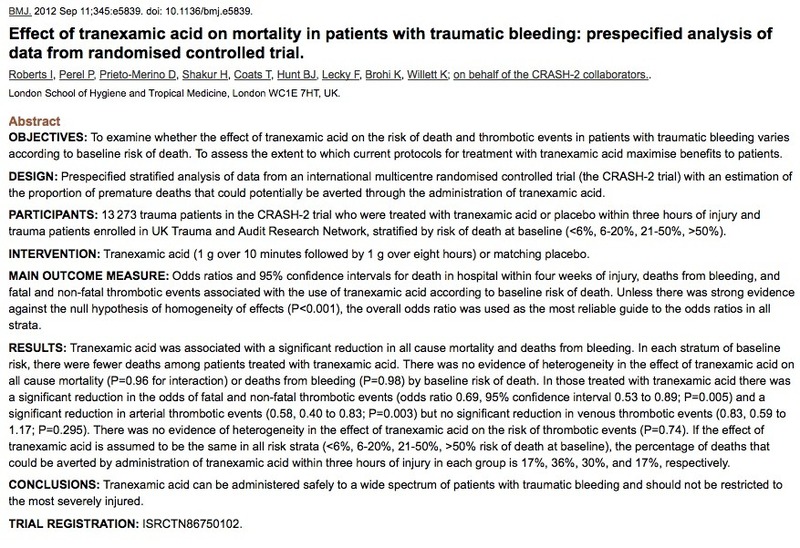 A few months back there was a short twitter conversation between (if I remember rightly) @adamchesters, myself and @karimbrohi about the use tranexamic acid for patients in the prehospital setting. At that time the picture was not that clear really as the data from CRASH-2 had not been analysed in such a way that might allow us to decide if this is a treatment for all trauma patients, or just those with the more severe injuries. This week’s BMJ has a sub-analysis of the CRASH-2 trial that compares the efficacy of TXA at different levels of pre-treatment probability of death (a fair indicator of severity I think you would agree). Arguably yes, this is a subset of the original trial which contained over 20,000 patients (subset as only those administered within 3 hours). Odd that really. I wonder if it explains the very different death rates they found compared to those they predicted. Even in the predicted death rate >50% the actual death rates were 5% and 7% which seems very different indeed. I can’t figure that one out as yet so please if anyone else can….. Arguably it does not make that much of a difference to the main finding (that severity of injury does not predict benefit), but I remain intrigued. Allow me to summarise – TXA saves lives regardless of your pre-test probability of death (in this subset of the original CRASH-2 cohort), and does not increase pro-thrombotic events. So, what does this mean for me? It pretty much means that in any patient who I suspect requires a significant blood transfusion I will be giving TXA. Now whether that can be transferred to a prehospital setting is still unknown, but the evidence is building that it’s probably a good idea, and in the absence of evidence we should perhaps just get on with it. Maybe TXA for trauma should be applied like ASA for chest pain? I think you’re right casey, particularly in areas with long prehospital times. Wonder what Minh and cliff think? Often sadly still it’s used late or not at all! Are we going to give it to kids-they are jsut small adults after all?! Yes of course. On the Virchester protocol it is 15mg/Kg as a bolus then 2mg/kg/hr until bleeding stops.